The article first appeared in my column Steven's Window, in The National newspaper of Papua New Guinea. December 31st 2009. 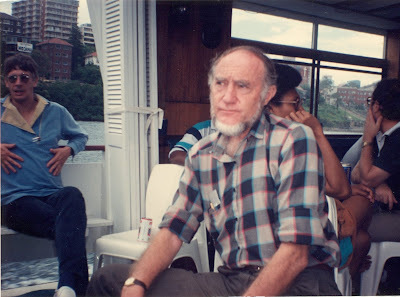 Picture taken by author in 1988 on a cruise in the Sydney Harbour. A year it was. Some of us will remember 2009 as a great year. Others will remember the year as a year of missed opportunities and tragedy. At this time of the year we also take stock of our lives, acknowledge the successes and losses, and re-cast our nets into the future. We also take a moment to reflect on the journey itself for what it’s worth. In the journey we met fellow travellers, advisors, mentors, and those who made decisions that changed us or stopped us from realizing our full potentials. The great mentors are hard to replace. I have known many such people in the journey of my life as a Papua New Guinean writer and scholar. Many such incredible people gave their knowledge, wisdom, time, and references to get me from where I was to where I am now. These people are beacons of inspiration in my life. In this last column of the year 2009 I wish to remember one person I owe so much gratitude and admiration. This person passed away in the middle of this year, on a bus in Auckland, after visiting Tonga on his way home to Rarotonga in the Cook Islands. The person is the late Emeritus Professor, Ron Crocombe, a man of majestic stature, wisdom, character, and scholarship. Ron has mentored many of the leading Pacific Islands scholars in one way or another throughout his life. He had maintained an abiding interest in the culture, history, politics, economics, land tenure systems, and social change in the Pacific Islands throughout most of life. He had published volumes of books and literature on the subject. He has undertaken research, consulting, lecturing, and administration in most Pacific Islands nations for more than 50 years of his life. He has worked for the Cook Islands government, the Australian National University (including being director of the New Guinea Research Unit in the 1960s, now known as the National Research Institute), University of California, East-West Center, Smithsonian Institution, University of Kagoshima, and the University of the South Pacific where he was Professor of Pacific Studies from 1969 to 1988, and founding director of the Institute of Pacific Studies. He has undertaken extensive consultancy for Pacific governments, the Pacific Community, Pacific Islands Forum Secretariat, University of Papua New Guinea, various UN and Commonwealth agencies, Asian Development Bank and others. Many of us, doing research on the study of Pacific Islands, cultures, literature, education, knowledge systems, and developmental studies, emulate the good professor’s style of scholarship. Some of us had the good fortune of being acknowledged in his various books. I first met Ron Crocombe in Sydney in 1988 during a conference on Australia’s relationship with the South Pacific Islands. It was a year after I had graduated with my BA degree from UPNG. As young and inexperienced as I was at that time, the meeting with Ron Crocombe changed my life around. On a boat tour around the Sydney Harbour I asked Ron to help me publish my first book of poetry. He said he would speak to Marjorie, his wife, who at that time was the Director of the South Pacific Creative Arts Society in Fiji. Nothing happened for the next few years until I met up with Ron and Marjorie again over lunch at the University of Canterbury, New Zealand, in 1991. The lunch was hosted by Dr. Malama Meleisa, the first director of the Macmillan Brown Centre for Pacific Studies at the University of Canterbury. The connection all of us have is the University of Papua New Guinea. Ron taught some courses at UPNG, Marjorie from Cook Islands and Malama from Samoa were graduates of UPNG. At that time of our meeting I was completing my Masters degree under a New Zealand government scholarship. After that lunch Marjorie saw to it that I had my first book of poetry published while I was still a student in New Zealand. Ron, Marjorie, and Malama took it on themselves to make sure that I found my footing in the area of serious writing and scholarship in the literature, arts, and culture of the Pacific Islands, especially about my own Papua New Guinean society. There was the sense of urgency in their encouragement. Ron had so much respect for Papua New Guinea. He observed with keen interest the social, political, economic, and cultural change in this country. He also maintained his relationship with key individuals in Papua New Guinea, who would call on him to provide wisdom and direction. Ron was always willing to come to PNG, when invited, any time of the year. I saw him last when he was here in mid 2008 for the UPNG Waigani seminar and customary land development seminar in Lae, Morobe Province. Ron, as always, was the towering figure, full of wisdom and advice to his young followers. He also had so much respect for what others have to say, and was willing to stand up for the underdogs. I did not get the time to talk much to him, but exchanged a few words of pleasantries and well wishes. It was to be the last opportunity I had of seeing Ron here at UPNG after my return from the University of Minnesota, USA. Ron had done a lot for me in terms of encouraging me to continue writing and publishing scholarship on the cultures, literature, and the knowledge systems of my country. Ron went as far as sending me personal copies of his monumental book The South Pacific (2001) and his other two books. In paying my tribute to the great doyen of Pacific Studies, Ron Crocombe, at this time, I am mindful of the scholarship in Pacific Studies, indigenous cultures, and knowledge systems began under the his leadership and others, which has given many young indigenous scholars, like myself, a stage to launch our career. Ron’s shoes are too big for us to wear, but we can follow the large footprints left on the shores of the Pacific.